We are using a OLForm to display the buttons and info we require. For some reason, sometimes when sitting idle for a while, Outlook will generate an error with the add-in. There are usually about a dozen identical stacked error messages to close. The add-in simply looks at the subject line and places buttons accordingly. The buttons either save the message or open another program. The error occurs when sitting IDLE not when using the buttons. I have tried hooking into the Exception event handler in the OLFormManager but it does not catch it. I have read in another forum posts that there is no global exception handler within the DLLs. I am stuck! How can I debug this to understand why the error is happening? Any threads in your code? Do you show the form in Explorer or Inspector? 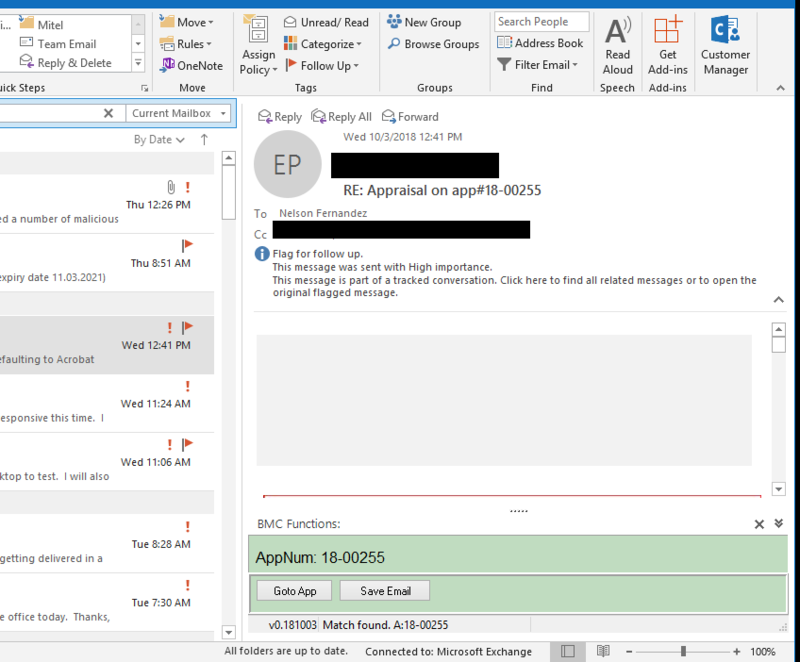 Check if there's an Outlook event that occurs right before the exception. 1) No threads that I am aware of. On change event it looks at message subject and then hides or displays button. Button events initiate actions to save message or launch process. The error occurs when sitting idle. For example, I left my Outlook running over night and it had about 12 errors this morning. 3) I will look at the code other events that may be firing. Thank you for the advice. I would also suggest that you add try/except blocks and debug messages to your code in order to locate the exception. Also, make sure you don't have any other COM add-ins turned on. I also have AV with our Outlook addin using TadxOutlookform. I myself am not getting the AV but one our our consultants is, same thing happens when his laptop is idle overnight and he comes back to it in the morning, there are around 18 AV messages on the screen to close. I am struggling to find a cause as I don't get it on my PC. One thing I can say is that on the previous version of Addin Express for Office I was using (8.1) this never happened and had been deployed more than a year. I upgraded to version 9 last month (to cure window appearing outside Outlook) and this started to occur. I'm terribly sorry: I've found out that the issue may be caused by Add-in Express and we have a build that supposedly fix it. I'll send you a download link in a minute or so. FWIW, I did not have the problem either until I updated to OL 2016 v1808 (I was on v1807) and i started to see the same issues as my users. Are you saying that the build that I sent you doesn't fix the issue? I'm sorry Andrei I was noting this detail for Tom, as I also did not have the bug in my dev machine until I uopdated OL. I am happy to report, the new build has run for me a solid day + overnight with no error so far. I have to check with my beta testers later and will report back. Can you detail the issue that was fixed? The bug was: extra instances of internal objects were created when WM_SYSCOLORCHANGE and other theme-related messages were received.